Varicella-Zoster Virus (VZV) IgG ELISA test kit is an Enzyme-linked Immunosorbent Assay intended for the detection and quantitative determination of IgG antibody to VZV in human sera. Varicella, more commonly known as chickenpox and herpes zoster are known clinical manifestations of infection with varicella-zoster virus (VZV). There are various methods of serodiagnositic tests for the detection of VZV antibodies in a patient's serum including: indirect immunofluorescence, neutralization, complement fixation and fluorescent antibody to membrane antigen (FAMA). FAMA is generally considered the most sensitive and specific of the methods, yet requires the use of cell culture which is cumbersome to perform. Clinical and correlation studies indicate that the ELISA methodology may be as sensitive and perhaps more specific than the FAMA assay. The sensitivity, specificity, and reproducibility of enzyme-linked immunoassays is comparable to other serological tests for antibody, such as immunofluorescence, complement fixation, hemagglutination, and radioimmunoassays. 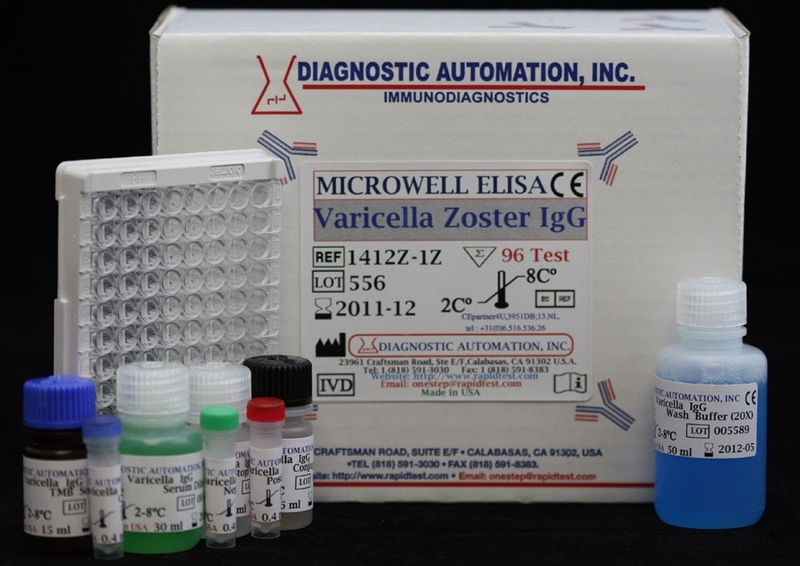 Varicella-Zoster IgG elisa Test kit is an Enzyme-Linked Immunosorbent Assay. Purified inactivated preparation of Varicella-zoster virus antigen is coated on the surface of microwells. Diluted patient serum is added to wells, and the Varicella-Zoster IgG specific antibody, if present, binds to the antigen. All unbound materials are washed away. After adding enzyme conjugate, it binds to the antibody-antigen complex. Excess enzyme conjugate is washed off and TMB Chromogenic Substrate is added. The enzyme conjugate catalytic reaction is stopped at a specific time. For additional details please refer to the instructions for use. 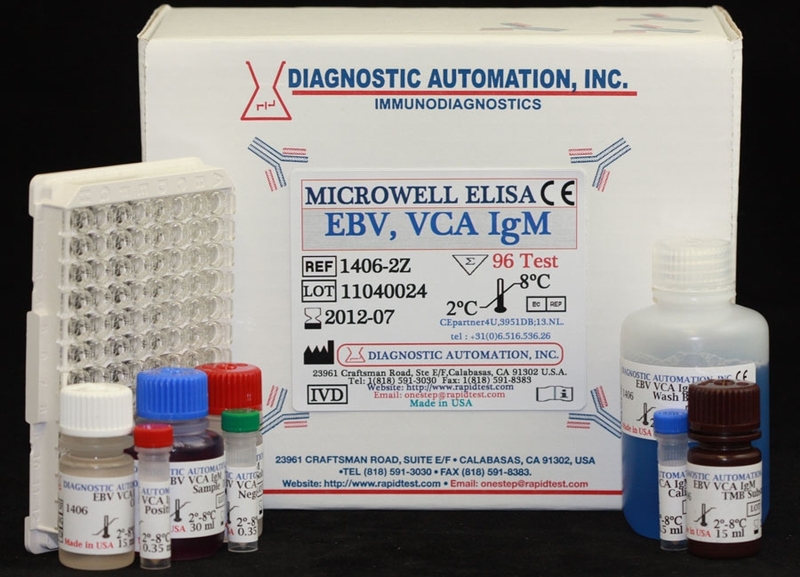 Diagnostic Automation Varicella-Zoster Virus IgG ELISA kit provides all the necessary reagents for the rapid quantitative determination of VZV IgG antibody in human sera. 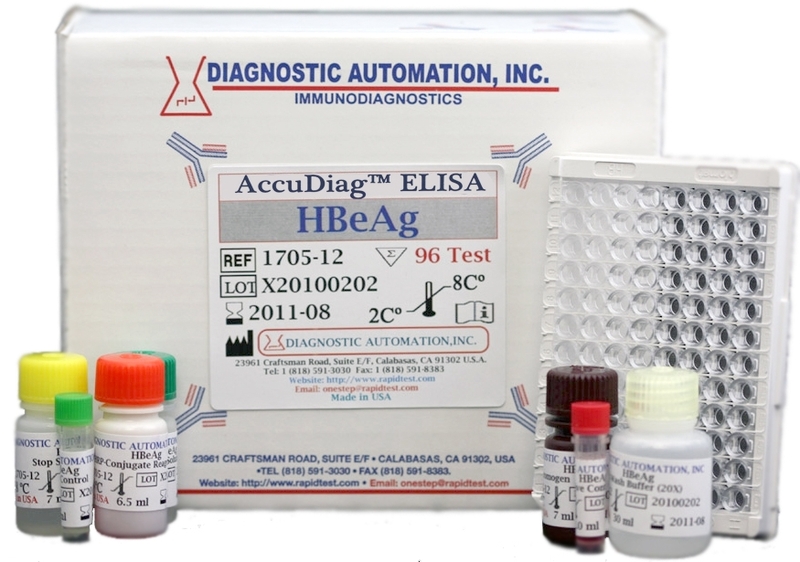 For more information about ELISA Kits, Rapid Tests, IFA Kits, CLIA Test Kits, or Serology tests , please see our website home page, or contact our Customer Service Representatives at 818-591-3030 818-591-3030. Our Varicella Zoster IgG Elisa Kit have high sensitivity and specificity. 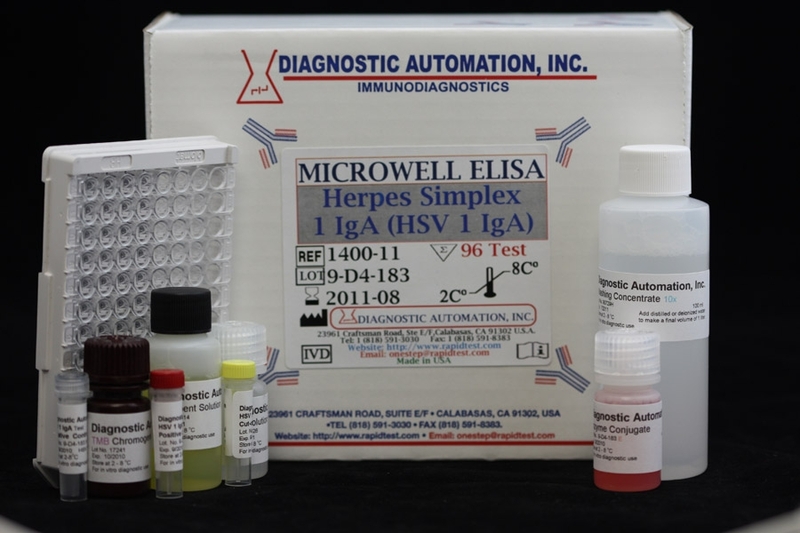 Individual serum specimens may be used for the determination of immune status. Paired sera, acute and convalescent, may be used to demonstrate seroconversion or a significant rise in antibody level, as an aid in the diagnosis of primary infection or reactivation with VZV.